mikeh wrote: I was wondering that myself, Steve. But my Latin doesn't qualify me to have an opinion. Nor does mine--which is why I present it as a query. I haven't parsed it (it takes me about an hour to parse a few lines of latin--the steele sermon over on tarotpedia took me a couple of weeks--and looking back at it now, it's in need of a few improvements!) --I am just going by immediate impression of what makes sense (and from past experience, I know that can lead one way astray). The "Eschec amoureux" of Evrart de Conty (1398) used 16 gods, starting with the planetary "Chaldean row" Saturn-Jupiter-Mars-Apollo (Sun)-Venus-Mercury-Diana (Moon) and Minerva as the 8th. Then follow 8 other gods: Juno-Neptun-Pluto-Cybele-Vulcanus-Bacchus-Aesculap-Pan. 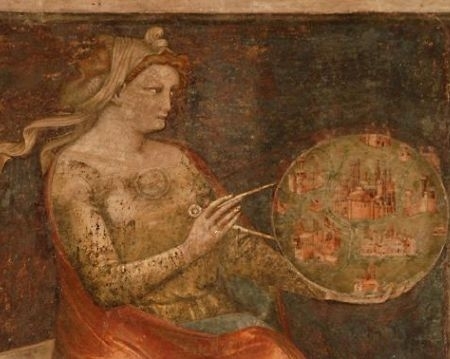 Lazzarelli around 1470 used the Spheres row of the Mantegna Tarocchi (also in the planetary Chaldean row + the 3 additions 48-50), then followed Poetry and Music (26+27), and after them Apollo plus Muses (11-20). Minerva as Philosophy (28) plus 4 other gods (Juno-Neptune-Pluto-Victory) on chariots finished the sequence of 27 units. Interestingly the row Minerva-Juno-Neptune-Pluto was the same as Conty's row, 8 Minerva, 9 Juno,, 10 Neptune, 11 Pluto. It also uses the planetary row + Minerva at the beginning, then follow 12 others, from which 8 also appear in Conty's selection (so Conty's system is completely included). The 4 new figures are till that Eolus, Janus, Vesta and Orpheus. A longer passage is then dedicated to Herakles, starting with Perseus (1 picture) and finishing with Herakles (12 pictures for 12 works possibly). Then Ceres forms the finish. Somehow 20 figures + Perseus + Herakles + Ceres, if one counts Perseus and Herakles as "one story", it are 22 units. All have some function for the model of the spheres, but the Michelino deck differs. I am not sure I follow why the placement of Justice should be considered a second thought? There is the conflation of Justice with God's Judgement, but that goes back to the 12th century at least - so inasmuch as it appears to reflect a tradition of associating the scales of justice with God's/Christ's judgement that is pre-tarot, in what way is it a 'second thought'? I would argue that B's placement of Justice is a "second thought" because the card depicts the cardinal virtue Justice rather than changing it into an eschatological final Judgment. It seems improbable that a first designer who wanted to portray the Judgment after the Resurrection would choose this figure with this title rather than something more appropriate, like the Archangel Michael or a judgment scene with sinners and saved being separated, right and left. Thus, it seems more likely that Justice formed an original member of the group of three cardinal virtues, whose positions in the sequence changed according to the preferences of players of different locations. In Ferrara, it appears that those players adjusted the virtues to moralize the sequence to avoid directly offending the figure of the Pope, letting him be trumped by Temperance rather than Love, and making sure that the Resurrection scene did not somehow imply apocatastasis, or that everyone is saved. After the Resurrection, there is still that pesky Judgment. Yes, but that 'pesky judgement' after the resurrection was symbolised in one Italian tradition at least with the scales of Justice. 12th century mythographies describe how the Golden Scales of Jove were translated into the heavens as the sign of Libra. By exention of Christian interpreters the Scales of Jove became rather the Scales of God/Christ. In zodiacs of the 14th century the sign of Libra can be found symbolised by the figure of a cross, the cross of Christ's crucifixion. Pierre Bersuire, in his Reductorum Morale (a popular source for preachers, sermon writers), Bersuire (a friend of Petrarch) writes: "When the Sun, that is Christ, ascends in the sign of Libra, that is, the Throne of Judgement..."
The cross of crucifixion itself was considered a type of scale or balance, in some depictions an actual pair of scales is shown on one arm of the cross, with one pan full of demons (to represent sin) outbalanced by a pan with symbols of Christ's passion, showing Christ's sacrifice outweighing man's sin. In commentaries on Job, in reference to the passage in which he wishes that his suffering could be weighed in the balance against his sins, the balance by typology is associated with the balance of the crucifix; by extension one pan becomes associated with the new testament, the rule of Love and God's mercy, against the pan of the Old Testament, the rule of Law and of retribution. In medieval reasoning, God has Lordship over Reason, Reason over Sensuality, and Sensualty over the Body, and this inner harmony or balance was termed the balance of scales of 'Justice', and was a factor in discussions relating to concepts of fate v. free will (and evil v. good). The scales of Justice, of Libra, were identified with God's Judgement under the new law, tempered by Love and Mercy. As Christ's sacrifice was representing as outweighing all men's sins, by extension I suppose it could also represent that heretical idea, salvation for all. The Scales of Justice are fine, a multivalent symbol. But in B, it is the cardinal virtue holding them. Does the cardinal virtue Justice ever stand for the final Judgment in any other iconographic context that you know of? I think the secondary usage argument is compelling, and hold B to be a reordering of the inherited sequence. I too think the 'second thought' possible, indeed probable. The conflation of Justice as individual human virtue and Christ's justice that developed between the 12th to 15th century is a literary rather than an iconographic one: nonetheless one the high ranking of Justice in the Ferrarese pattern, suggesting a higher concept would fit in with. It is a literary tradition I was aware of sometime ago, when studying Chaucer and medieval rhetoric, but put it to the back of my mind and had never related to the Ferrarese pattern. My computer has gone kaput and I am using my partner's when it is free (which is rare), and I have been reminded of this tradition while re-reading Chaucer and the Country of the Stars by Chaucey Wood, the last chapter of which, on the The Parson's Prologue, discusses the symbolism of Libra, Justice and the Judgement, some of which appeared to me could be applied to the high ranking of Justice in the Ferrara pattern; this seeming iconic conflation of Justice and Judgement reflecting an already established literary tradition (by and large, as Wood notes, an Italian one; Chaucer made extensive use of Italian sources). The School of Guarino, with its teachings on the role of Justice in Good Governance, may also have had a role in the appeal of such a conflation, and the high ranking of Justice in the Ferrara type tarot. Teachings that had significant influence upon Leonello, Borso & Ercole d'Este. (Borso's identification with Justice as a virtue, based upon topoi of Guarino, is an example already discussed in relation to the high ranking of Justice in the Ferrara type tarot, but it goes back to Leonello too, and is reflected also in the letters from Boiardo to Ercole d'Este). I have been thinking about this discussion between Steve and Ross. I am tending to lean toward Steve's side, as he originally put it, but with questions. What I don't understand is how the cardinal virtue of Justice is any different when God exercises it than when humans do. It is the same virtue, just executed more perfectly by God. In fact, humanity's ability to be just comes from God, where the archetype originates. That the picture doe snot show the archangel Michael holding the scales is not relevant. When I look up at a relief of the lady with the scales in a cathedral, I am not meant to think, "that is human justice, not God's." The lady with the scales is an inclusive allegorical figure, including all applications, human as well as divine. Likewise when Justice in the B order is put high, that does not mean it does not also refer to the human duty to be just, and not by being polysemous but in the same meaning of the term. It is then a separate matter whether, in a particular narrative, to emphasize the human duty of justice as opposed God's will to be just at the Last Judgment (not a duty for Him, but his exercise of the virtues is what makes him a perfectly good God). Putting the virtue lower down emphasizes one aspect, putting it near the top emphasizes the other. To say that the designer of the tarot meant it to emphasize humanity's duty to be just is to assume that you know already where the designer meant to put the virtue, which is precisely the point at issue. I am not saying that one or the other has priority, just that you can't tell which it is, just by looking at the card and knowing it designates the cardinal virtue of justice. It is the same for the other virtues. When Fortitudo is illustrated by a lady with a broken column, that suggests Samson, whose superhuman strength toppled a pagan temple. That strength came from God. By analogy, when the Christian refuses to recant under torture and in the arena with lions, that strength also comes from God, whose own strength, morally and physically, knows no limitations. When temperance is illustrated by a lady pouring from one vessel to another, that virtue of self-control is also from God. It is what allows the monk in the desert to suffer all sorts of privations for years, often on top of a little platform most of the time (at least according to legend). God has perfect self-control, but it is self-control nonetheless. For this teaching in a book that was being read closely in the 15th century (in a new translation by Traversari, c. 1437, but it had also been translated in earlier centuries), see pseudo-Dionysius, Divine Names 896A for Justice (righteousness), 936A for Strength (omnipotence), and 717A for Temperance (perfect self-control). It is surely elsewhere, too. (Perhaps other authoritative texts said something else, I don't know. If so, we don't know which book the designer followed.) The only reason that these virtues don't make sense at the top, it seems to me, is that at the Last Judgment it is the virtue of Justice in particular that comes to the fore. What am I missing? The World card, as a new Jerusalem type, and model for how a city may seek to aspire to or represent itself, in the case of Ferrara we could see as being based upon Augustine’s description of the New Jerusalem as ‘vizio paci’, a vision of peace. In its foreign affairs Ferrara as a negotiator of peace among the war-torn city states was one pursued by Niccolo d’Este and continued to be followed by Leonello, Borso and Ercole d’Este. SteveM wrote: The World card, as a new Jerusalem type, and model for how a city may seek to aspire to or represent itself, in the case of Ferrara we could see as being based upon Augustine’s description of the New Jerusalem as ‘vizio paci’, a vision of peace. The only "World" card that fits that description - an idealized city (not a landscape vignette of an earthly domain) - is Milanese: the PMB.